Dr. Gillian Marcelle, executive director of the Virgin Islands’ Specialist Economic Development Agency, the UVI RTPark, addressing VIP guests at the June 7th Investment Showcase in NYC. CaribPR Wire, NEW YORK, NY, Weds. June 14, 2017: There is a simpler way to invest in the Caribbean and the US Caribbean territory of the U.S. Virgin Islands. That’s the message Dr. Gillian Marcelle, executive director of the Virgin Islands’ Specialist Economic Development Agency, the UVI RTPark, brought to potential investors, executives and members of the Caribbean Diaspora, at the agency’s VIP Investment Showcase Reception during Caribbean Week in New York on June 7th. “We are ready to help you set up a business in the U.S.V.I. in as little as three to four months,” Dr. Marcelle told the some 60 plus VIP guests at the Showcase in the financial capital of the world. “We see the UVI RTPark as an entry point to the US and a bridge to the wider Caribbean. A company establishing in this Caribbean US territory will profit from a number of benefits, including up to 90 percent reduction in income taxes for qualifying income, as well as reductions or exemptions in other taxes. From this base, you can serve clients anywhere in the world. Christopher Halliday, partner at Morgan, Lewis & Bockius LLP, told the audience, the RTPark will foster economic growth, not just in the USVI, but across the Caribbean. Applying for membership to the RTPark program is simple and involves three stages: screening and pre-application; negotiation of a term sheet and a formal application procedure. The RTPark is keen on attracting technology companies in health and medicine, energy research & system deployment, as well as marine science related products and Internet advertising and software development. Meanwhile, Chairman of the UVI RTPark’s Board of Directors, Edward E. Thomas, lauded the agency’s first Caribbean Diaspora focused marketing efforts and reminded investors that there is no limit to the number of companies who can become clients of the program. And President of the University of the Virgin Islands, Dr. David Hall, said that he looks forward to the ongoing public/private sector partnership between clients of the RTPark and the University as the agency continues to promote the U.S.V.I. as an impact investment hub for the Caribbean. 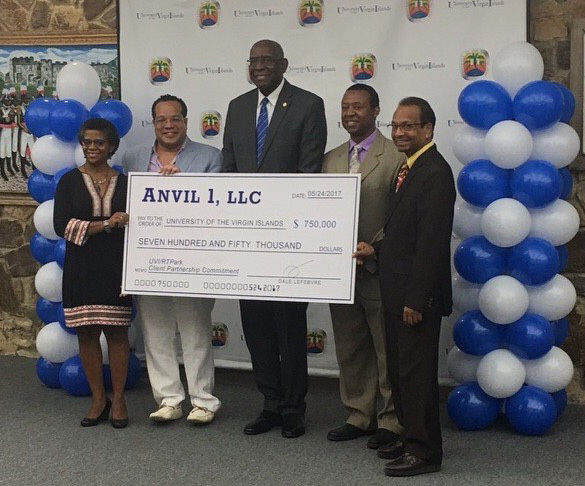 Dale Le Febvre, one of the newest clients in the UVI RTPark and founder of Anvil 1 LLC, presents a donation for USD 750,000 to the University of the Virgin Islands on May 24, 2017. CaribPR Wire, NEW YORK, NY, June 2 2017: The US Virgin Islands Specialist Economic Development Agency, the University of the Virgin Islands RTPark, (UVI RTPark), is focused on becoming an impact investment hub for the Caribbean. 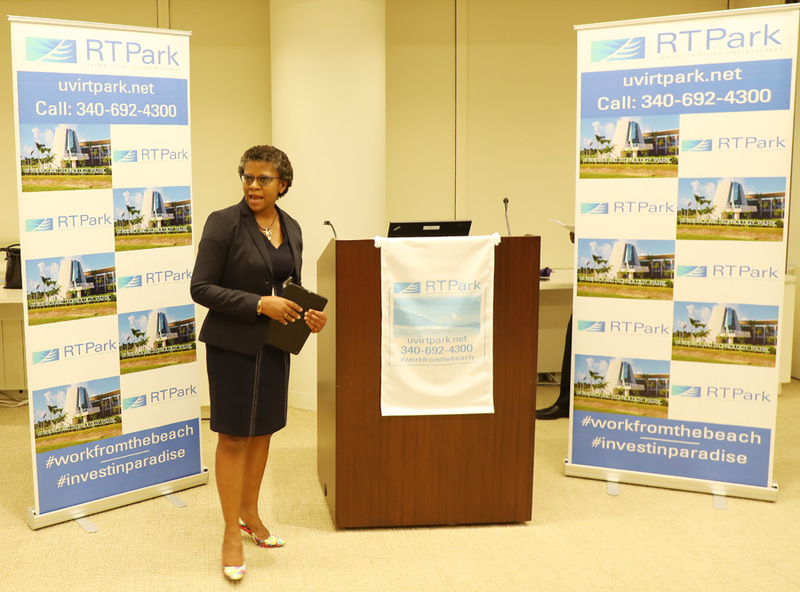 As the financial world shifts to embrace mission-oriented investing, the RTPark’s Executive Director, Dr. Gillian Marcelle, says the USVI is ready to lead the region in this sector. Dale Le Febvre, one of the newest clients in the UVI RTPark, embodies the spirit and intention of impact investing. Through Anvil 1 LLC, Le Febvre is investing in the USVI, through the RTPark, and is already giving back. Not only the youngest African-American to donate more than USD 1 million to the new Smithsonian National Museum of African-American History and Culture, he places great importance on education and has shown the way by investing in building the technical workforce of the future in the USVI and pledging social investments of US$750,000 over the next 15 years to the University of the Virgin Islands for scholarships, research and teaching programs in process technology and energy. Le Febvre, born in Beaumont Texas, is no stranger to the Caribbean, having lived in St. Thomas for the last seven years and having been an investor with Michael Lee Chin in AIC. Using the skills and knowledge gained from his MIT Engineering, Harvard Law and Harvard MBA degrees, in combination with native intelligence and insights, Le Febvre has been able to generate value in places where others see none. He is now the owner of five large African-American-owned companies in areas where there was little diversity, such as data center management, long haul trucking, pipelines and mortgage finance. Join Anvil 1 and many other businesses that have established businesses in the US Virgin Islands to take advantage of the many incentives offered while enjoying an island lifestyle and making a difference. Join us via Facebook live at UVI Research and Technology Park or on Twitter @UVI_RTPark at 6:30 p.m. EST on June 7th as we share from New York City how the UVI RTPark can make a difference in your business and help you #WorkfromTheBeach.